Katra, March 16 - The Governor Jammu & Kashmir, Mr. N. N. Vohra, , who is the Chairman Shri Mata Vaishno Devi Shrine Board, visited Holy Cave of Shri Mata Vaishno Devi today on the commencement of the Holy Navratras and performed Pratham darshan at the Sanctum Sanctorum. The First Lady, Mrs. Usha Vohra, accompanied the Governor during the visit. The Governor, while covering the track from Sanjichhat to the Holy Cave on foot, interacted with the pilgrims and enquired about the facilities made available for the smooth conduct of the pilgrimage. The Governor, took stock of the facilities made available for the pilgrims and issued instructions to his Principal Secretary and the Chief Executive Officer of the Shri Mata Vaishno Devi Shrine Board (SMVDSB), Mr. Raj Kumar Goyal, who also accompanied him during the visit, for initiating timely action in respect of plantation of fast growing species of ornamental and flowering trees, shrubs and creepers, all along the track, compatible with the local soil and climatic conditions, to continuously improve the ambience of the track and its surroundings. He also called for planting trees to check soil erosion on sustainable basis and stressed the need for propagating locally available wild flowering plants along the track to make it beautiful and environment friendly. The Governor directed the Board authorities for replacing the old and worn out CGI sheets of the shelter sheds from Sanjichhat to the Bhawan with specially designed thick metal sheets, wherever required. He also instructed for initiating steps for hill stabilization measures, in consultation with the known experts, for ensuring the safety of the pilgrims. The Governor was informed that the work has since commenced for creating a fire line by cutting grass and weed along the track between Banganga and Bhawan. The Governor, who is the Chairman, SMVDSB, inspected the dispensary at Bhawan and enquired about the medicare facilities put in place for the Yatris. He directed the CEO to have the medical facilities upgraded. Regarding provision of a pony stand in the Bhawan complex area, the Governor was informed that a site plan for the purpose has been formulated by the Board. 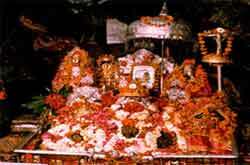 Click here to read more information on Mata Vaishno Deviji.